Why the spate of big cat attacks on guided tourists? The past month was not a great one for guided tourists and wildlife. Two incidents caused particular concern with the latest occurring on Thursday 02nd July. Lion Attacks and kills tourist, and injures guide through open vehicle window at Johannesburg Lion park. Leopard Attacks Wildlife guide in Kruger National Park on a vehicle resulting in injury to the guide and subsequent death of the Leopard. These incidents have 3 things in common: Big cats; wildlife guides and vehicles. At the very least our visitors to Africa should feel an additional element of safety whilst in a vehicle with a qualified guide in charge. We feel it necessary, for the sake of our clients’ piece of mind at least, to take a step back and examine what we know of the scenarios and how injury could have been avoided. Especially, as the frequency of these incidents seem to increase. The attacks, as reported by eyewitness accounts, both could have and should have been avoided. Lion Attack – The lion park incident occurred when a guide and tourist in a closed hired car, refused to obey the warning signs to keep windows closed. A lioness attacked the guest through her open passenger window and she was killed. 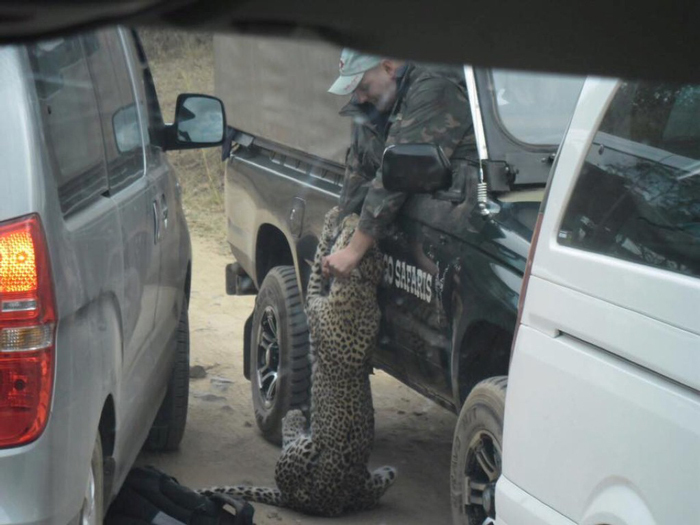 The guide, who was driving, was injured as he tried to fend off the huge cat.Points for bravery… however in my opinion, that really counts for little by the time you have allowed this to happen to your guest. On the day in question a leopard was spotted next to the road and was reportedly displaying clear signs of interest in vehicles as well as being in poor condition and very thin. Alarm bells should immediately start ringing for any guide. It doesn’t take more than a second glance at such an animal for an experienced guide to be able to identify a potentially dangerous scenario. The first rule in guiding should always be, situational awareness, meaning: Never drop your guard, view an entire situation and understand it as a whole. Do not only focus on what is the focal point for everyone else. According to eye witnesses statements released by SANParks, the guide was with about 6-8 tourists on his Open Safari Vehicle, watching the leopard some two metres from the vehicle. “The animal cunningly disappeared, probably went around the guide’ (driver)’s side while the group was still searching for it. The guide had relaxed on the OSV when suddenly the leopard leapt and grabbed his arm, trying to jump into the vehicle,” said SANParks spokesperson. What is immediately alarming is the description that the guide had relaxed on his open safari vehicle. This is a very distinct description and it should have been immediately evident to the guide that the leopard was in bad condition and displaying alarming behaviour. Why then such a relaxed disposition as described by onlookers? All decent guides know that old, sick or wounded leopards pose a particular danger to people as they are prepared to change their hunting behaviours in desperation and in such cases are known to cross a very clear human/animal boundary which exists in normal game viewing scenarios. The incident resulted with the leopard being run over three times in desperate attempts to stop it from a deadly pursuit of the most chilling kind. The leopard was reportedly euthanised due to the extent of injuries. The guide thankfully escaped with his life and is reportedly recovering from injuries to his arm in a nearby hospital. In both these incidents the common rules of engagement for guides in the particular scenarios appear to have either been ignored or were not already known to the guides. Making what should be the safest way to observe wildlife, i.e. from a vehicle, suddenly appear anything but. With the lion incident the animals, although captive are not tame and pose higher than normal threat to visitors as they have lost their fear of humans and developed an association of people with the vehicles. Why was this not recognised by the guide who should have a full understanding of this situation and the potential danger? With the leopard incident, from photographs and eye witness accounts, it was abundantly clear the animal was in poor condition and was displaying immediately alarming behaviour. Why did the guide relax to the extent he did in such a close encounter scenario and why did he not recognise the warning signs? In conclusion, it is a very important responsibility of the tourism industry that well trained guides are charged with the care and well being of our cherished wildlife visitors and wildlife. The guiding industry is full of remarkable individuals with immense talent. It is unnecessary to tarnish that image by allowing such incidents to occur when ignoring the basics. Our guests need to have confidence that the people handling their experiences are as well informed and equipped to handle potential dangers as they possibly can be. Situations of conflict between predators and wildlife visitors on a vehicle should rarely occur. These are scenarios which, through correct understanding of animal behaviour, can easily be avoided by trained and experienced guides. This industries image is what we make of it, and we strongly believe ecotourism is the last real chance the successful conservation of wildlife has. There are already real challenges to wildlife tourisms longevity in Africa , let us not add to those challenges by allowing compromised standards in any arena of the industry.